Here are some things I’ve pondered, found, or thought to share this week. One simple yet powerful thingie (and a multi-decades LONG overdue thank you): Way back in the early ’80s, I was graduating from 8th grade and my friend Staci’s mom, Betty Smith, gave me this Tiara Exclusives paperweight as a graduation gift. This paperweight has traveled with me to many places, and it always finds itself within view on a shelf or mostly on my writing desks for all these years and through every book I’ve written. The quote has been essential. It’s taken me through many ups and downs and put some real action into my starry-eyed ideas. The quote: What You Dare To Dream, Dare to Do. Thank you, Betty, for a gift that’s lasted in ways I can’t express. I hope this gift will inspire all of you as well. Get to work on those dreams! 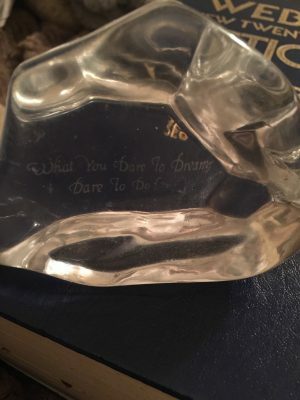 Tiara Exclusives paperweight – What You Dare to Dream, Dare to Do. 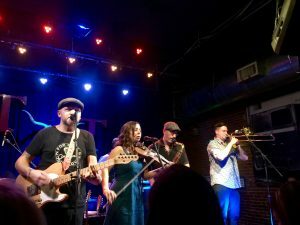 Last weekend, my friend Tam gave me a great late Christmas gift with a night to the Tractor Tavern in Seattle to hear her favorite band The Paperboys. They were awesome! We also met some fantastic people, Lorie and Aaron, and I realized that I really need to get out more. It was quite a night. One new favorite song to start the year is Better Than The Last. Also Fragile, California, City of Chains, well, just go listen. I’m doing so right now. And just saying in advance, you are welcome (maybe, thank Tam too). One question for the week – Do you know what cryptocurrency is? If yes, I’d love to hear your thoughts on it. If no, I’ll give my definition next week. We all really should at least know what it is, someday you may be using it. Last week’s one question – I mentioned picking a word, quote, verse of the year. I’ve heard a few people’s and realized I didn’t put mine. “Wonder” has been a word for several years and continues in my life (see Wonder List above). It’s a theme to keep seeing the wonders in little and grand things. This year “mastery” seemed to follow me. I need to press out of some good things and get to great things – in a number of areas. So we’ll see how that goes. What about you? If you’ve found something interesting that you’d like to share, please do! Next week, I’ll get back to some techie and gadget and other awesome finds. One picture to leave you with if you’re on Instagram: NASA posted this amazing image of Jupiter. And this incredible, “mind-bending” they called it, and yes it is. I spent a bit of time staring at these. God’s wonders just never cease. And guess what? I’ve already met a goal for the year by beating the number of posts for all of last year. So okay, I didn’t post at all last year, but still! You gotta celebrate the wins when you have them! Go 2018! It’s going to be Better Than the Last. Until next week when I’ll be in Washington DC, be blessed and look for the wonders! You have always inspired me with your insights on life and it’s beauty. To love the past, cling to what is useful, forgive and forget the pain when it seemed it might overwhelm you. Time to move on.